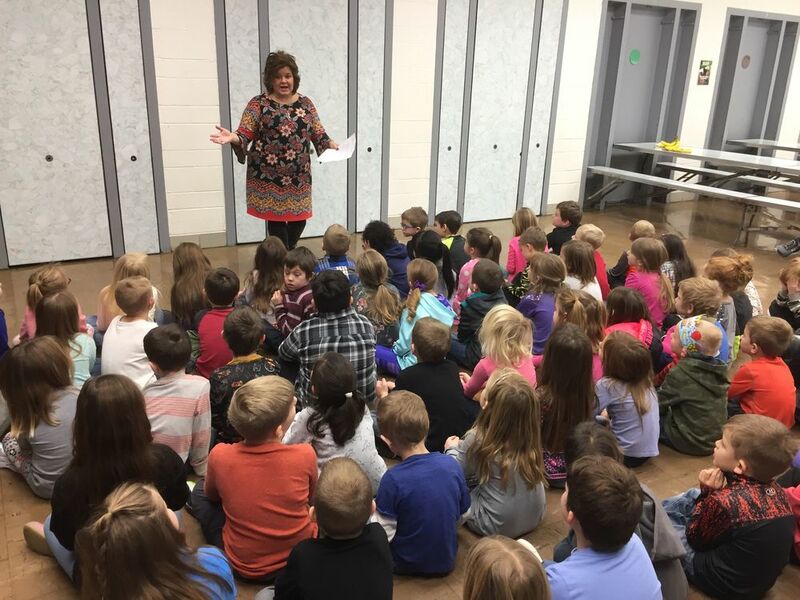 Shelbyville Alumni & Local School Board Member, Ellen Trainor, speaks to Main Street & Kindergarten Students regarding ENTHUSIASM on Friday, January 5th. Students are definitely developing skills and confidence w/ exposure, practice and feedback for Reading, Writing, Math, etc... but they are also learning about themselves. Who am I; Who do I want to be? We often learn this through mimicry, experiment & mistakes. 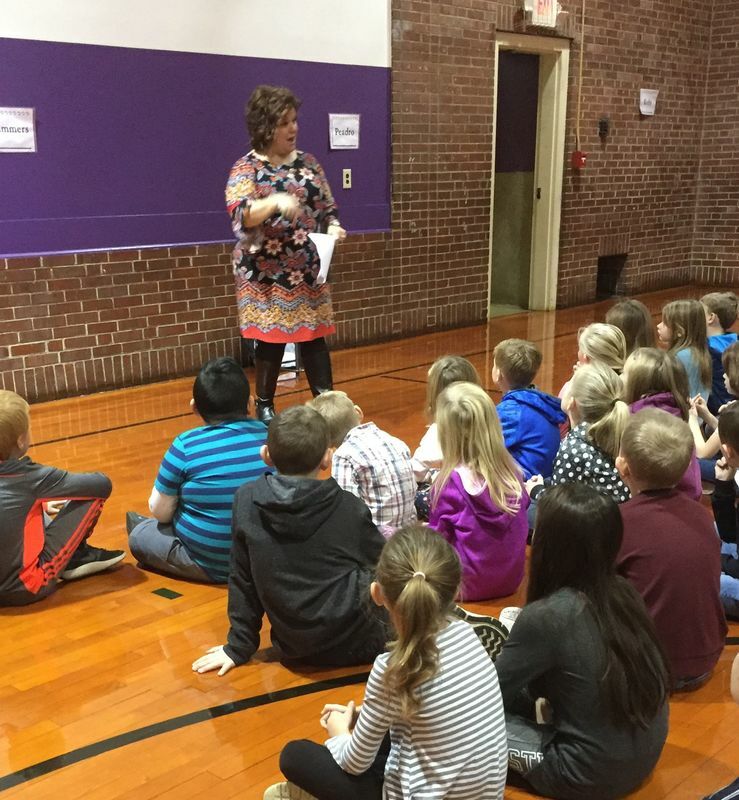 Mrs. Trainor began her discussion w/ a brief introduction of herself & her personal history w/ Main Street School. She was once a student @ Main Street School & her children have also been students. She "has a deep love for Main Street School" & her mother was once Principal of the school. 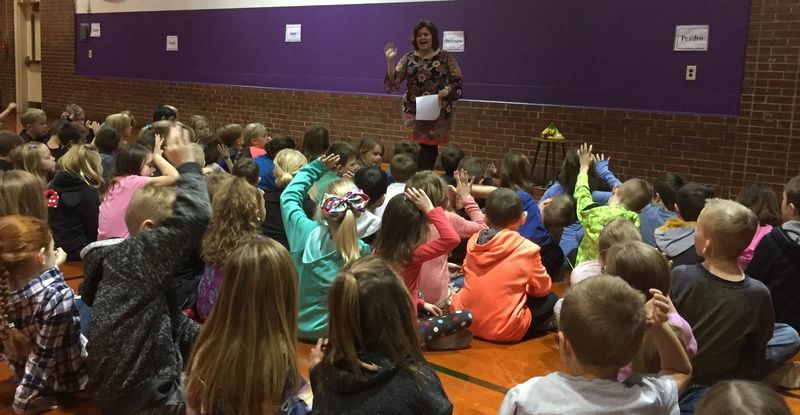 W/ this connection to the school and leadership experience, it is no wonder she serves as an active School Board Member for Shelbyville Schools. She began her transition into ENTHUSIASM w/ defining the term. She gave the Merriam-Webster version & her "Ellen" version. So..."what does ENTHUSIASM look like," she asked. Students responded w/ synonyms , characteristics & onomatopoeia: joy, excitement; WHOOP! Mrs. Trainor modeled Body Language such as a walk & a greeting w/ a smile. Why is ENTHUSIASM important? There are personal & collective benefits. Personally, we can control our attitude & find more joy in our lives w/ ENTHUSIASM. We also perform optimally when we can find satisfaction in our work. This would be an example of a single banana in her metaphor. The classroom would be considered a "hand" or a few "bananas" together. This is our class & our class is our most immediate School TEAM. Positivity & Energy are contagious. This can add to the experience of peers & other TEAM Members which amplifies their Positive Energy for you to feel. This adds to the whole Learning Environment. Be a good TEAM Member by doing your part to keep The Positive Energy high & sustained. This will become the CULTURE for the entire school or "bunch of bananas." Ellen also used a light bulb & failure story regarding Thomas Edison. His ENTHUSIASM led to eventual historical success w/ sustained Positive Energy. We tell students, "if you try hard enough for long enough, you will be successful." The Focus is on endurance. The Problem is often not that people cannot do something; it is that they give up too early. Thank you so much, Mrs. Ellen Trainor, for you message regarding ENTHUSIASM.